A Community Archaeology project to reduce nighthawking! What do YOU think?! 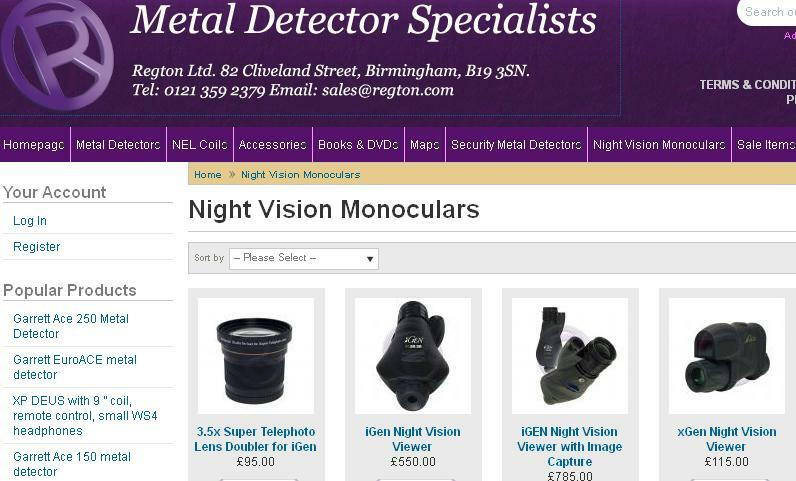 Is it OK to sell night vision items in Britain’s largest metal detector shop? Are they (as the makers say) just a ” ‘must have’ for Treasure Hunters who need to scout out sights at night“? or (as one detectorist says) “for guarding my metal detecting sites from night hawkers“? Or is their main use likely to be for nighthawking itself? I think we all know the answer! But how can it be happening? Well, it’s because this is Bonkers Britain and hardly anyone has complained about it. How do I know that? Because if they had, Regtons would surely have desisted. So here’s a wide open opportunity for ordinary members of the public to get involved in community archaeology and make a contribution towards site protection. Please contact sales@regton.com and tell them what you think. Let’s see how long it is before those pages are deleted. We’ve previously demonstrated to The Establishment that muscular outreach can be more effective than limp-wristed appeasement. A second demo straight from the community would be good. Regtons are now promoting a forthcoming comedy sitcom about artefact hunting. It’s a laughing matter you see. But what isn’t a laughing matter is that they are STILL selling a range of night vision items that nighthawks use and describing them as METAL DETECTING ACCESSORIES. There is some “Heritage Action” for you! Within minutes of you posting this the page [http://www.metaldetectorshop.co.uk/shopping_cart/index.php?_a=category&cat_id=112] disappeared (or have they just sold them all?). But there are plenty of other dealers selling them to write to. well done Mr Swift.